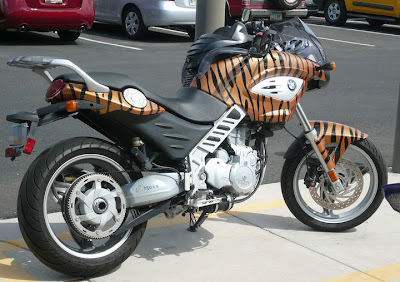 A question is, what kind of a person rides around on a motorcycle painted with tiger stripes? And if that is how they have decorated the motorcycle, what type of tatoos do they have? This motorcycle does not look macho enough for the rider to be a Hell's Angel's type with a sleeveless denim vest, tatoos covering his arms, a bit of a beer belly, and three-day old beard, a tooth pick hanging out of his mouth. The rider of a tiger-striped motorcycle is likely to be more upscale. Maybe with a matching leather jacket and pants, with decorative metal studs, a striped shirt with a wide collar, an over-sized belt buckle, slicked-back hair, a goatee, and he likes to listen to Elvis. His tatoo would probably be something like a hula girl under a palm tree. Sharon, next time you see this motorcycle, please stake it out and take a photo of the owner. But please don't tell him I asked you to do it, and certainly don't tell him about this comment or where I live. Also, I hsould note that Arizona does not have a law requiring motocyclists to wear a helmet. Just read David's comment..still laughing. I think I could handle it though. That is a sleek looking machine. Fun looking too! =) Yeah I agree with david, I wonder what kind of person who rides a ride like this. Nice! It might be a girl's bike but I'm not so sure. I can't tell for sure if it's on the sidewalk but the bike riders here who would park on the sidewalk are couriers. But that looks like an expensive paint job and most of the couriers around here tend to look like can't even afford soap. Sharon, I'm afraid you're not going to be able to close off this post until you track down the owner. I also need to know if the helmet is stripey. I'm going to make a guess that the owner is a woman in her 70s who was tired of always playing by the rules and decided to fulfill her need for speed. No senior center and bridge for this gal -- it's a tiger bike and the open road! That's hilarious, and I loved the title of the post! I can't imagine who could want to ride a bike like this!